London Irish centre Seilala Mapusua insists that he wants to fully enjoy the time he has left with the club. 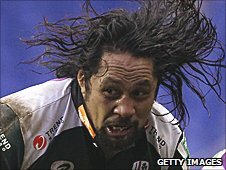 The Samoan announced in January that he will be heading to play in Japan at the end of the current season. But he told BBC Berkshire: "Although I'm excited by the new challenge, it still hasn't fully sunk in yet. "In the meantime, I'm just focused on doing my job here at London Irish, taking it one game at a time, prolonging the time I have left here." After explaining why he decided to leave Irish, Mapusua said that his team-mates have been understanding. "The financial side was a big positive," he said. "Especially at the stage I am in my career. "I have to look after myself and my family and also it's a bit closer to home. "And it's a chance to experience a different culture in a different part of the world. "But we've got a really good group of guys here and they were all really positive. "That lasted about an hour and then all the stick started." Mapusua, who has been captaining the Exiles team in the absence of Clarke Dermody, said that it was particularly rewarding to lead some of the young players who have featured in recent matches. "I've been really impressed with the young guys who've been asked to step up," he said. "Hopefully, I've led them in the right direction. "Because of the character of these young players and the way they've been coached, it's been a seamless transition coming into the first team." Irish travel to Gloucester this Saturday, needing to win to keep their LV= Cup hopes alive. But Mapusua says that it is not just about this tournament, admitting: "We want to keep the momentum going. "After the 10 defeats we had, no-one wants to go back to that. We want to take some form back into the Premiership." Gloucester v London Irish (Saturday 5 February, 1500 GMT), live on BBC Radio Berkshire.